Marking the 200th anniversary of the birth of Charles Dickens, this short film tells the story of the writer's troubled childhood. 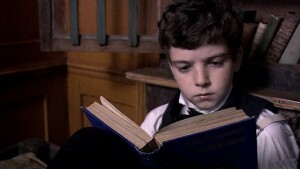 Dickens's father was habitually in debt and young Charles's education suffered as a consequence. Though he dreamed of going to school he was sent to work in a blacking factory to earn a much needed wage. Small wonder, having been a child labourer himself, that Dickens would in later life rage at the exploitation of children by the Victorian economy. The cast includes Michael Maloney as the adult Dickens, Robert Daws as his father and Maureen Beattie as his mother. The programme is shown as part of the BBC Two Learning Zone http://www.bbc.co.uk/learningzone/schools/, offering programmes which could be of specific use to teachers in the classroom. It will also be available to watch on demand on BBC iPlayer.